Should You Buy Extended Protection for an Outboard Motor Warranty? No one expects his home to burn to the ground, yet we buy house insurance. No one expects their brand new marine engine to give up the ghost immediately after the warranty expires. Still it makes good sense to consider an extended warranty protection plan for an outboard motor or stern drive. Particularly since the price of a outboard motor warranty contract is significantly lower than the cost to repair a catastrophic failure. You should also know an extended protection warranty plan does not include repairs due to normal wear and tear or aging. If you religiously maintain running gear, you can expect long service life and therefore the need for an extended warranty plan fades into the background. Adequate marine engine maintenance requires regular checking and topping off of vital fluids like engine oil and gearcase oil. Even more importantly, it means thoroughly decommissioning the power head when it's not going to be run for four or more weeks, even when the dormant period falls in the middle of the boating season. Without fogging oil protecting the cylinder walls and piston rings, they're prone to rust, which hastens the death of a motor. On the other hand, if you shamelessly neglect your motor, an extended warranty plan is a cheap investment. In general, extended warranty plans cost from a couple of hundred dollars to as much as $4000. The bigger the outboard motor or stern drive, and the longer the coverage the more expensive the premium. While you don't have to sign on the dotted line at the same time you buy a new motor, doing so saves a considerable sum of money. Procrastination up to six months will cost from $100 to $1000 more than the base price, again the bigger the motor, the more you'll pay. Keep in mind, you can add the cost of a extended protection plan to the purchase price of the motor, thereby including it in your monthly payment. 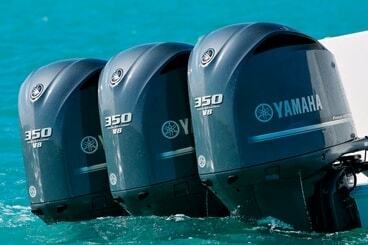 Evinrude, Mercury, Yamaha and Suzuki all offer extended warranties. Depending on the company, one, two, three and four year plans are available. Besides engine manufacturers, extended warranty protection is also available from third parties. Consult your local dealer for specific information. Know that warranty extension costs are linked to the size of the engine and the number of years of additional coverage. For example, Yamaha's price for an extended service contract on its F250 four-stroke runs $1,654 for 12 months, $2,310 for 24 months and $2,860 for 36 months. The longer the term of the extension, the lower the cost of coverage per year. In comparison, a warranty extension for a Mercury Optimax 175-horsepower direct-injected two-stroke costs $1,000 for one year, $1,600 for two years and $2,200 for three years. Yamaha Extended Service Y.E.S. plan coverage was designed and is administered by Yamaha Marine. Y.E.S. takes over automatically when the original factory warranty expires. There is no deductible. It's transferable. Y.E.S. coverage includes Travel and Recreation Interruption Protection, effective from the date of Y.E.S. plan purchase, even during the factory warranty period. Expenses related to a covered failure can be covered up to $250 per occurence. This includes food or lodging expenses, transportation expenses, and even a charter or rental boat can be covered.